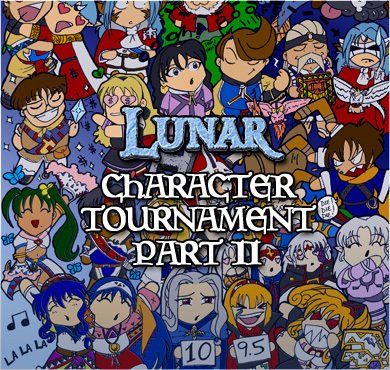 Welcome to the second Lunar Character Tournament here at LunarNET! Yes, this idea came from all the character tournaments over at GameFAQs, but always cool to add a new twist to it, and being a Lunar site, our twist is that the characters are from the Lunar series. The tournament starts on Saturday (the 23rd) and will run until just before Christmas. The first round or two will feature a new poll every day, so if you want to participate in the tournament, make sure to check back daily. We've upgraded this tournament from the one three years ago, in that instead of 48 characters, there are now 64 characters. We've added both Magic School and Dragon Song characters, to give all Lunar games some kind of representation this time around. The tournament is represented below the poll, and shows eight different brackets, each with 8 seeded characters. Characters are seeded based on three criteria. First is how well they performed in the previous tournament (Lucia taking first, Alex second, etc.). The second is based on their importance as a character in their respective game. And lastly, based on the game they come from (ie. Magic School's heroine Elie isn't going to be seeded above Eternal Blue's hero... Hiro). So make sure to come back often and vote for your favorite character(s)! Let the polling begin!